...fallen in love with a shoe style only to find they don't have it in your size? ...visited 2 or 3 or 4 shoe stores, not finding anything you really like? ...wished your small town shoe store had more variety? ...been frustrated because you just can't find a pair of shoes you like? If Adidas has it their way, this will all be a part of your past. This past Tuesday (1.11.11) at the 2011 National Retail Federation's convention in New York, Adidas unveiled a back-to-the-future spinning interactive Virtual Footwear Wall. This innovation makes it possible for shoppers to look through as many as 8,000 shoes portrayed in 3-D format. Shoppers will be able to spin the shoe to look at it from different angles, zoom in on specific details, listen to a video, or learn fun facts about the shoe. 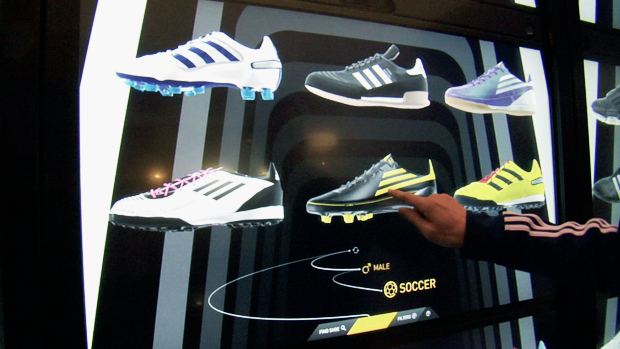 All these shoes will be at your fingertips, through the use of a touch-screen display. Interestingly, the shopper isn't the only one to benefit from this high-tech innovation. Retailers will now be able to offer a complete line of Adidas shoes regardless of the square footage of their store. As Chris Aubrey, VP, Global Retail Marketing for Germany-based Adidas said, "We've leveled the playing field for small retailers. They can now act like a big flagship store in a town like New York." This wall was made possible through a joint partnership between Adidas and Intel. Unfortunately, it is still a visiion for the future. Current plans are to roll out the first prototype in the UK in 2012.